Starcraft's top-of-the-line SX series just raised the bar on innovation and luxury. In the last year, a number of boat brands celebrated their 50th anniversary, which is an amazing achievement considering the ups and downs of the economy during that time. So 115 years in business is definitely no accident, and that’s where Starcraft finds itself. Founder Harold Schrock started working for the Star Tank Co. in 1903. Soon after, it diversified from solely building water tanks to include the manufacture of boats and was renamed Star Tank and Boat. Schrock bought the company in 1926, focused it solely on boats and renamed it Starcraft. Schrock sold the company in 1966 and it changed hands five times before Brunswick sold it back to the Schrocks in 1995 — and it’s been a private, family-owned business ever since. Not being part of a huge conglomerate has its advantages, including being able to nimbly adjust with the times, a trait evidenced by Starcraft’s latest and most sophisticated expression of luxury: the SX 25 C DC. The SX 25 C DC features an all-new look that includes black painted tubes and a high-end automotive paint job on the fencing that creates a mirror-like finish. Black mounts for the stainless steel rub rails continue the theme. Two-tone fencing and a near-vertical stainless mirror accent further the unique look. Three segmented, horizontal chrome accents at the bow look like a car grill. 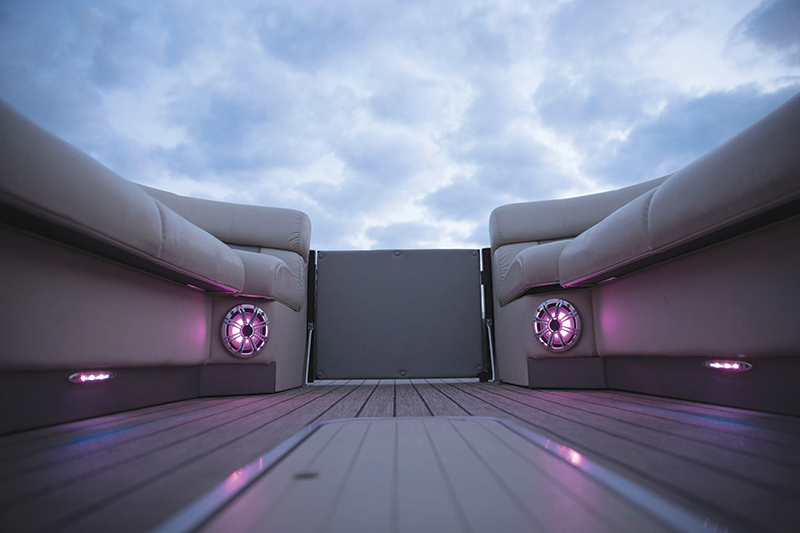 While rear recliners for at-rest use are a current pontoon trend, they consume a lot of real estate, so Starcraft designers created a rear lounge that sits at an oblique angle and conserves space. Its fiberglass frame becomes part of the sidewall look, which is also a popular trend, and the entire seat bottom lifts up — reminiscent of a yacht-like stern trunk — to reveal a popup changing room that can be customized with a portable head. Placing it adjacent to the roomy swim platform is a good call, because skiers and swimmers can change out of wet suits without dripping their way through the cockpit. A cool feature I’ve never seen before is a slide-out polished stainless steel transom gate that does its job and looks good doing it. 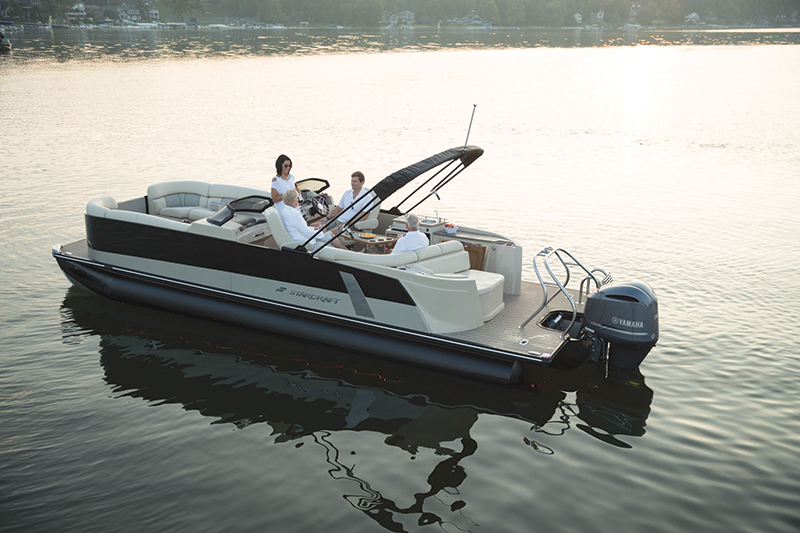 Starcraft ensures the 26-foot, 10-inch SX 25 C DC can support up to 14 passengers by making triple tubes mandatory. It’s optimized for performance with the HMX PR25 Performance Package, which includes three 25-inch-diameter tubes; the center one has two high-efficiency lifting strakes and the outer ones have a strake on the inside. The strakes deliver plenty of lift, great performance out of the hole and a higher top speed. Our test boat was equipped with its max power, Yamaha’s 4.2L V-6 F300. Starcraft will rig the SX 25 with a buyer’s engine choice, and given the performance numbers we gleaned, 300 — like in bowling — seems to be the perfect number for this boat. With zero bowrise, it was difficult to tell exactly when it reached plane, but at 2.3 seconds, I detected a faint bow drop. Its time to 30 mph was 5.7 seconds. After I trimmed the Yamaha out, the front half of the tubes levitated above the water, which netted the SX 25 C DC a top speed of 44.4 mph. The driver sits at a raised helm station and is partially protected by a smoked glass wraparound windshield whose sporty new design is unique to the SX Series, and he grips an eight-spoke wheel connected to power steering as a standard feature. The intricately molded dash has everything, including a pair of Yamaha Command Link multigauges and quad analog engine gauges that are largely redundant. All the accessory rocker switches sit high and to the left — out of the way to prevent accidental engagement — and set inside a faux wood-trim pod is a standard Simrad NSS7 GPS chart plotter with an advanced Total Scan transducer that delivers a great view what’s below. Shifting is easy with the drive-by-wire throttle, and the clunk of gear engagement is all but eliminated by Yamaha’s Shift Dampening System (SDS), which uses a splined rubber hub to absorb the forces and minimize that metal-on-metal sound. The SX 25 C DC responds well to trim and turns well, even with the trim up. Because there are no lifting strakes on the outside of the outer tubes, the boat banks inward slightly during hard turns and carves a ridiculously tight arc, which is great for quick skier retrieval. 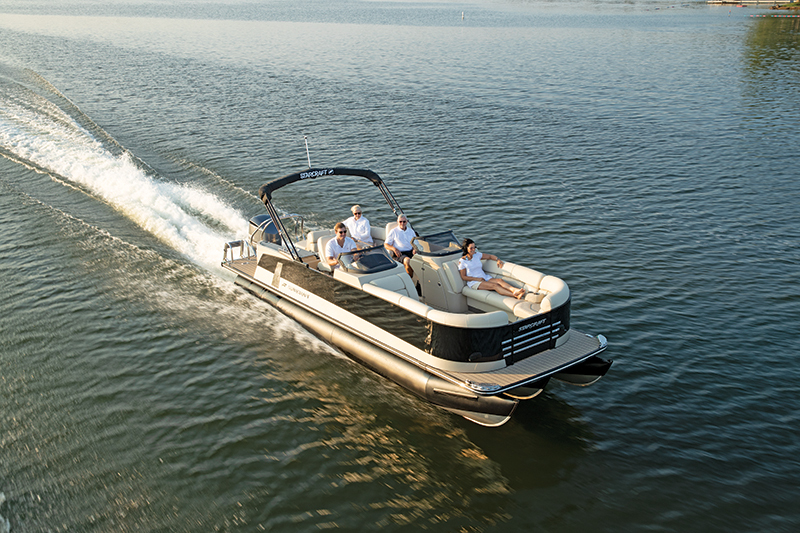 To create a solid feel underfoot and eliminate rattling, Starcraft uses “heavy hat” understructure to solidly connect the deck to the pontoons. The SX 25 C DC is optimized for entertaining. The galley is behind the driver’s seat, and its two large working surfaces — both done in a beautiful faux marble fi nish — facilitate food and beverage prep and display. Its wine rack — wine rack!? — encourages on-water tastings, and a stainless steel sink is there for cleanups. Woodgrain cabinetry looks like it belongs in a household kitchen, and a large, irregularly shaped, upscale cockpit table combines faux granite and woodgrain and fits the space perfectly. 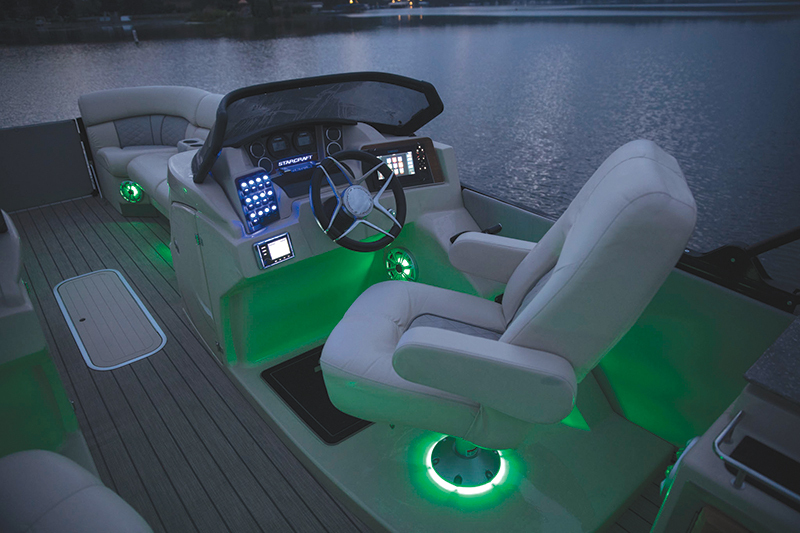 Post-sunset cruises are encouraged by extensive RGB LED mood lighting throughout the boat, even in unusual places such as at the base of the twin helm chairs, in lighted cupholders and speakers, and under seats. For added effect, the mood lighting changes colors. The standard package includes Babbito exterior lighting, under-deck lighting and underwater lighting. 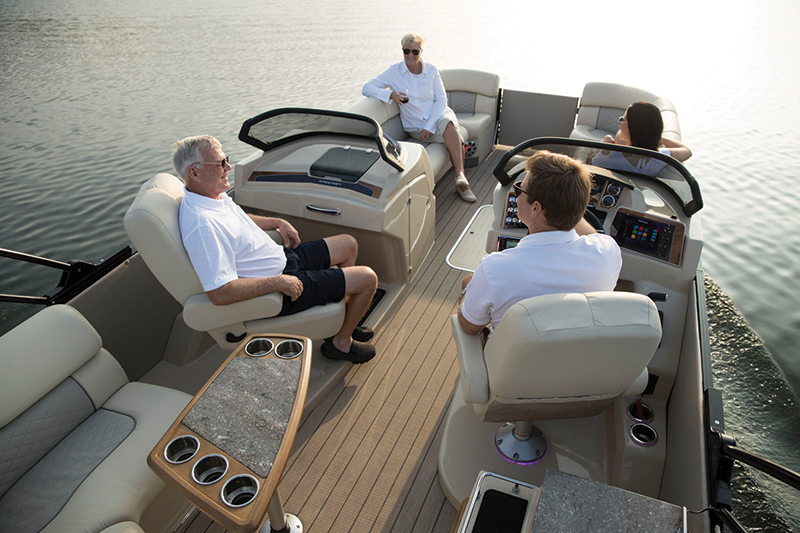 SX Series pontoons come standard with a premium Kicker KMC20 six-speaker Bluetooth stereo system that employs a subwoofer to produce more depth of sound. And for more shade, an upgraded 10-foot Bimini top is included. The boat is watersports-ready. Its newly designed swim platform–mounted ski tow gets the tow rope above the outboard, and its oversized boarding ladder with swimming pool–style grabrails makes reboarding a breeze. The standard in-tube ski storage compartment is big enough to stow large deflated towable tubes. Starcraft has six SX models from which to choose. Some, like our test boat, are 26 feet, 10 inches long, while the others, the SX 23 versions, are 2 feet shorter. The SX 23s have the same layout from the helm aft but have shorter bow recliners. Other layout choices include three models that have twin rear lounges (R models) instead of the angled L-lounge on the C models. While our test boat had dual consoles, single console models give buyers a portside rear recliner and a port boarding gate the DC models lack. All the furniture is covered in Soft Touch vinyl, which is supple but durable. Being an ultra-premium model means the SX 25 C DC is loaded with features that are usually options, which is reflected in its MSRP of $101,425. The options list is pretty short but includes a few items of interest, including a vinyl alternative to the standard carpeting. Sea Weave is offered at $1,035 while an all-Marine Mat deck will cost $2,245. If wakeboarding is high on one’s list of activities, a sport arch is available for $14,930. Length 26 ft., 10 in. Dry Weight (hull) 3,940 lbs. Time to Plane 2.3 sec. Time to 30 mph 5.7 sec.